Kids Room Art Print. Nature Themed Boys Room Art. Southwest Snake Watercolor Art Print. Colorful Snake Artwork. Green Snake Wall Art. 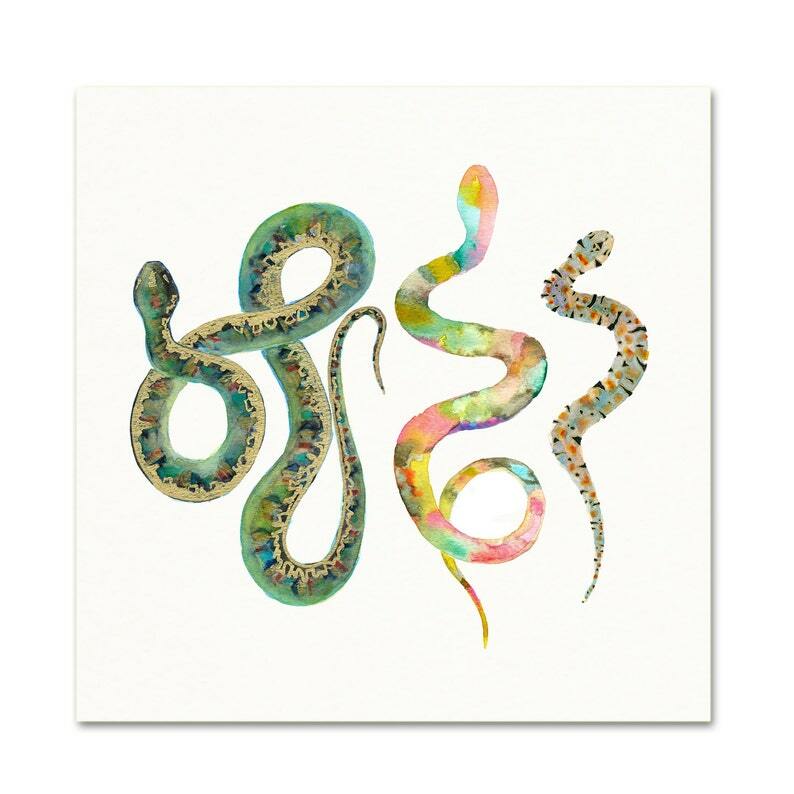 This is an archival print of my original watercolor snake painting.
. All prints are created from Sarah Martinez's Original Artwork.
. All Prints are made one by one from my home studio.
. Prints come lightly initialed below the image. Please let me know if you'd prefer your prints unsigned.
. All prints are made with Epson Archival Inks on 100% cotton rag paper. The paper is natural white in color (opposed to bright white).
. Prints are packaged with recycled white backing board in a clear protective sleeve. Larger prints are loosely rolled in a strong mailing tube. *Please message me for Wholesale information. 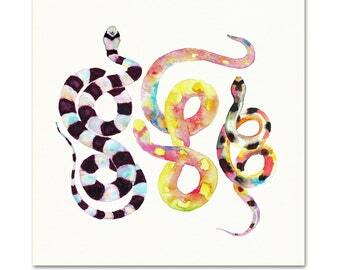 Watercolor Snake Art. Tribal Serpent Wall Art. Playful Snake Art Print. Colorful Kids Room Art. Southwest Decor. Wild West Boho Art. Snakes. Snake Watercolor Art. Tribal Decor. Southwest. Serpent. 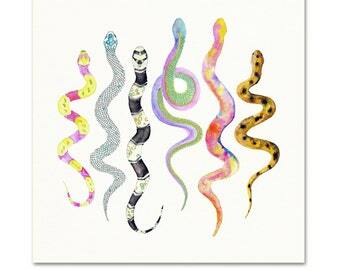 Watercolor Snakes Art Print. Green Snake Painting. Nature Wall Art. Garden Art. 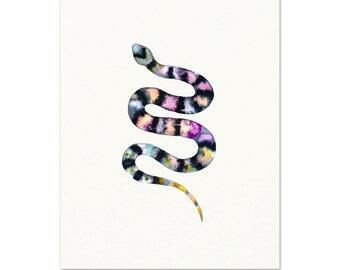 Serpent Art Print. Tribal Snake Watercolor Art. Kids Decor. Snake Art Print. Bright Tribal Snake Artwork. Boys Room Nature Painting. Black / White / Yellow Snake Painting. Southwest Art. Wall Art. Hipster Apartment Wall Art. Southwest Boho Wall Art. Cactus Art Print. 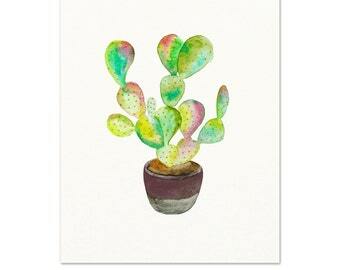 Watercolor Houseplant Illustration. Southwest Art. Southwest decor. Moth Watercolor Art Print. Pink Moth Wall Art. Modern Nature Painting. Moth Painting. Unique Kids Room Art. Baby Shower Gift. Pink Moth Art. Beetle Art Print. Colorful Insect Art. Bright Bold Kids Room Decor. Watercolor Bug. Beetle Watercolor Art Print. Boys Room Art Print. Love this print, it's so beautiful! Southwest Snake Watercolor Art Print. Colorful Snake Wall Art. Multi-Colored Nature Artwork. Modern Nature Painting. Green Snake Wall Art. Watercolor Striped Bass Wall Art. Realistic Striped Bass Painting. Lake House Decor. Fish Art Print. Bass Art. Fisherman Gift. Dad Gift. Gorgeous and so lifelike. Fantastic quality! Watercolor Butterfly Art Print. Orange & Gray Butterfly Art. Pastel Butterfly Wall Decor. Baby Shower Gift. Modern Nature Gallery Wall Art. Orders are packed securely in stay-flat mailers or shipping tubes to keep your items protected in transit. If your item arrives damaged, or if it is not what you expected, I'd be happy to replace it or refund you. Just let me know, I want you to be happy with your purchase! Orders are shipped to the exact address that is provided to ETSY, please be sure that this address is your current shipping address. Please feel free to message me about any specific shipping questions or requests :-). INTERNATIONAL ORDERS are marked as "merchandise" with the accurate values specified as it is illegal to do otherwise, the buyer is responsible for their country's customs fees. I am an approved Etsy Wholesale seller. Please ask me for my linesheet. If you'd like your print in a size other than you see offered in my shop, just message me and I'll create a custom listing for you. I use a heavy, 100% cotton paper that is a natural white color (opposed to bright white). I also use archival pigment based inks which saturate the paper beautifully making the print look just like the original. 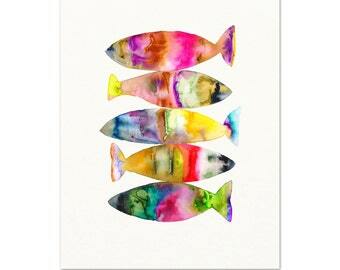 Watercolor Fish Art Print. Colorful Abstract Trout Watercolor. Brightly Colored Fish Painting. Bathroom Art. Kids Room Art. Nursery Decor. Feather Art. Watercolor Feathers Art Print. Colorful Boho Feather Art. Watercolor Nature Painting. Gift for Her. Sweet Pretty Nursery Print. Watercolor Art Print. Pink Moth Illustration. Pretty Bug Art Print. Nature Art. Modern Kids Room Decor. Baby Shower Gift. Woodland Art. 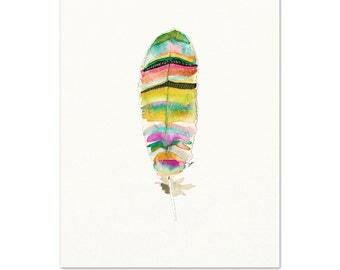 Tribal Feather Art Print. Watercolor Feather Art. Southwest Feather Painting. Eclectic Living Room Wall Art. Modern Tribal Gallery Wall Art. Toucan Watercolor Art Print. Tropical Rain Forest Wall Art. Tropical Decor. Toucan Bird Painting. Kids Room Art. Tropical Gallery Wall Art. Blue Watercolor Feather Art Print. 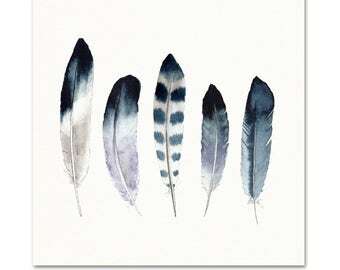 Indigo Watercolor Feather Art. Masculine Office Decor. Modern Monochromatic Feather Art. Southwest Art.